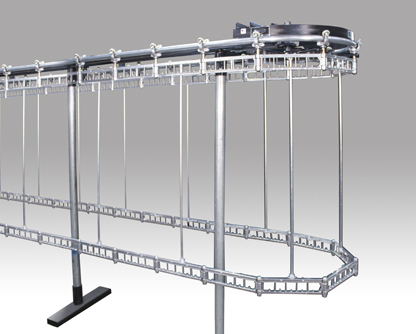 This unique White Conveyors product offers two full levels of hangered garments that operate together at the touch of a button. The Double Deck Stor-U-Veyor provides double capacity for shirts, pants or other garments. 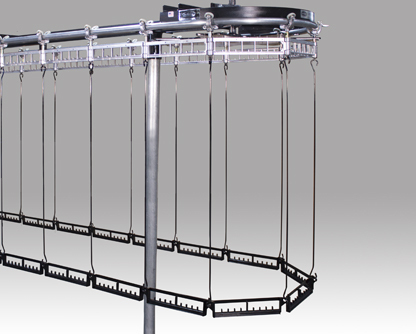 Available in two configurations: DS, with fixed lower level cast aluminum chain; or DW with removable nylon lower frames. DW model permits mixing of long and short garments as needed. The DS model has 12" wide, 10 slot cast aluminum upper and lower frames with fixed drop rod every 2 frames. The DW model has 12" wide, 10 slot cast aluminum upper frame and 10 slot nylon lower frame with removable drop rod every frame (available in any length). DS 8'-2" 7'-2" 3'-7" 5'-0"
DW 8'-10" 7'-10" 3'-11" 5'-3"